Run time is approx. 50 minutes. Join us for excerpts from a new musical in development at the Alley Theatre. 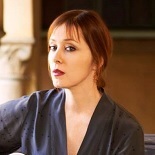 Grammy Award-winning singer/songwriter Suzanne Vega pays homage to renowned Southern writer Carson McCullers (The Heart is a Lonely Hunter, The Member of the Wedding) in this new musical about the outspoken, perceptive and wild dreamer who became one of the brightest literary lights of the 20th century. The songs, co-authored by Duncan Sheik (Tony Award for Spring Awakening), richly capture McCullers’ instinctively rebellious nature and forward thinking philosophies on race, gender and love. Lover, Beloved will be featured as part of the Alley Theatre's 2017-2018 season, February 9 through March 11, 2018 in the Neuhaus Theatre.